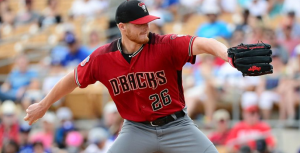 The Arizona Diamondbacks were excited to welcome back Shelby Miller from the DL Monday night. It’s been a long road back for Miller since undergoing Tommy John surgery last May. The Diamondbacks could also use a boost to their starting rotation. Unfortunately, his return didn’t go the way Miller or the Diamondbacks were hoping it would. Miller was roughed up Monday night by the light-hitting Miami Marlins. He was given a rude welcome by Miami first baseman Justin Bour, who hit a home run in the first inning. Miller failed to settle in after that, ultimately giving up five runs on six hits over 3.2 innings. He also needed 85 pitches just to get that deep in the game. On the positive side of things, he struck out five in his abbreviated start. However, Miller also took the loss and now owns a 12.27 ERA one start into his 2018 campaign. Despite the loss and the early exit, both Miller and the Diamondbacks are choosing to keep things positive. After all, he’s back in the big leagues following a 14-month rehab from serious elbow surgery. It was Miller’s first start in the majors since April 23, 2017. The Diamondbacks have struggled to fill out the back end of their starting rotation this season amidst a series of injuries. Tijuan Walker was lost early in the year to Tommy John surgery. Robbie Ray has been out since the end of April with an oblique injury. Losing those two has forced Arizona to reach into its farm system for help. With his start on Monday, Miller became the 10th different starter the Diamondbacks have used this season. In addition to Miller returning, Ray is also set to come off the DL later this week. However, just as those two return, Clay Buchholz was lost to an oblique injury over the weekend. Buchholz has been surprisingly effective in his seven starts for the Diamondbacks, giving the Arizona rotation a much-needed shot in the arm. As long as Buchholz is sidelined, the Diamondbacks won’t have much rotation depth, even with Miller and Ray back in the mix. With the Diamondbacks clinging to a 1.5-game lead atop the NL West, they need some stability from their starting rotation. Zack Greinke, Patrick Corbin, and Zack Godley have all stayed healthy this year and been reliable. But now they need Miller to provide some stability to the back end of their rotation upon his return. His first start back from Tommy John was unconvincing, but the team has hope that things will get better.